Combine all ingredients in crock pot (I put the chicken in first, sprinkled it with taco seasoning then pressed the garlic over that and then ended with the salsa on top) and cook for 10 1/2 hours. (I cooked the chicken, which was frozen when I put it in the crock pot, for about 6 hours on high and it came out perfect.) 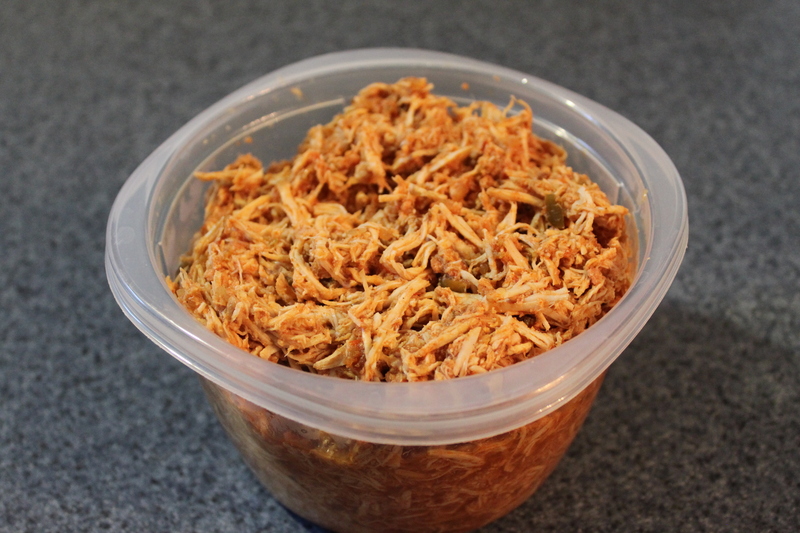 To shred chicken, remove from crock pot and 2 forks to pull apart. Add sauce back into shredded chicken. It turned out GREAT!!!! The one 16 oz bottle of salsa was enough. Of course I had to put the salsa through the blender because Jantzen won’t eat eat salsa or food with vegetable chunks, so maybe that made it a little more runny. the flavor was awesome. My family approved. Thanks Penny! I’m so glad to hear it, thanks for letting me know! If your family likes pork you can do this same recipe with pork; I tried it with a pork loin and it was just as good as the chicken.